My friend Molly put me on to Purplette onions a few years ago and I’m so glad that she did. 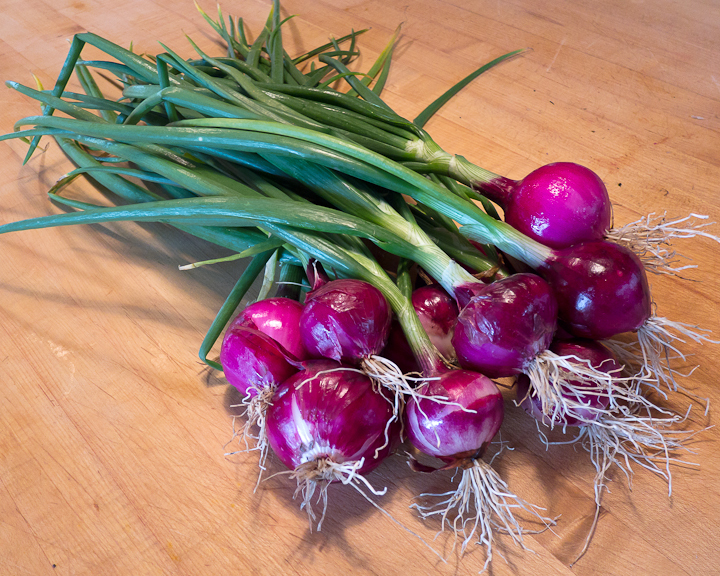 What a treat to have a crop of sweet, tender onions come in just as the winter storage onions are running out. Johnny’s classes them as mini onions as opposed to scallions or bunching onions, perhaps because they form a bulb or perhaps because they are small and take half as long as storage onions to reach eating size. I started the seed indoors mid-February at the same time that I started storage onions and set them out in the garden in late April, spacing them three inches apart in rows 12 inches apart. They grew slowly in this year’s cold, wet spring, but by late May there were onions to harvest. The first year I grew Purplettes, I harvested a few just as the bulbs were forming, cut off half of the green stems, brushed on a little olive oil and roasted them in a hot oven. They softened quickly and were ready to taste in fifteen minutes. We stood next to the oven and ate the entire batch. They were that good. They have a sweet, light onion flavor and are unusually creamy. More often now I wait to harvest them until they are a bit larger than golf ball size. 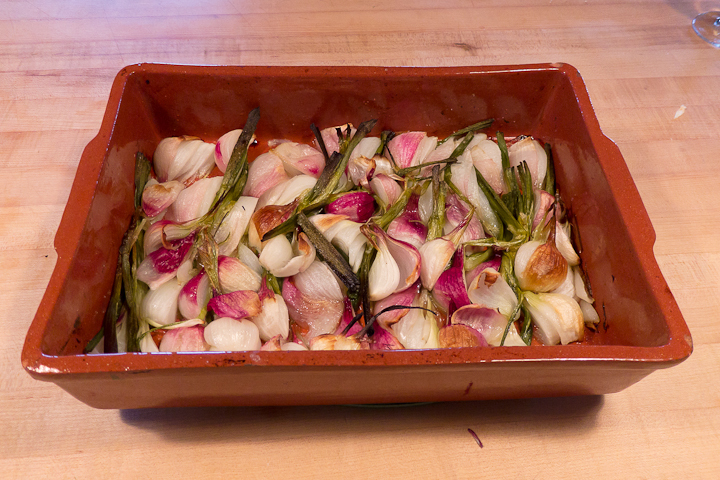 I trim the roots, cut the greens off four inches or so above the bulb and slice the onion and stem in half or quarters before arranging them in a single layer in a roasting pan, brushing them with olive oil and sprinkling on some salt. In a 425-degree oven, they roast in twenty to thirty minutes. I take them out before they are completely soft yet they still melt on the tongue. They are a perfect side dish with sausages, grilled polenta and grilled radicchio. I’ve also added them to peas for a pasta sauce and used them as a pizza topping with fresh artichokes. I haven’t pickled them yet because I’m so fond of them cooked but I’ll try to save some out next year and experiment. Each year I’ve grown a few more rows of these delicious mini onions and each year I wish I’d grown even more. Thank you, Molly! 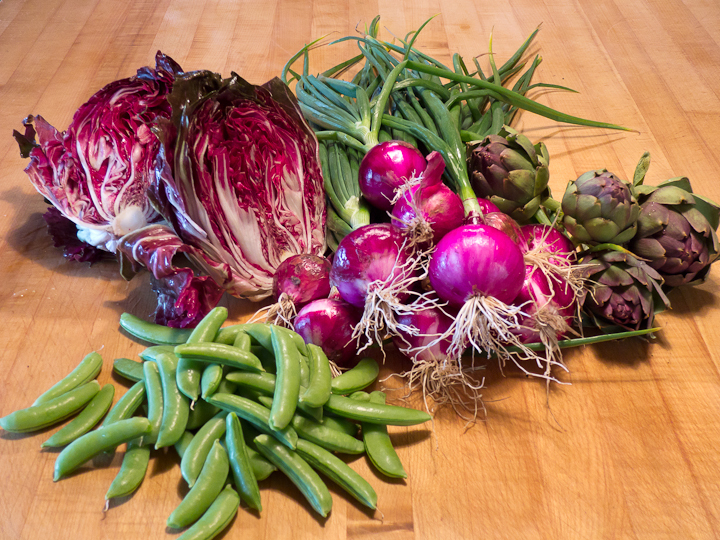 This entry was posted in Spring Vegetables and tagged Purplette mini onions by Lopez Island Kitchen Gardens. Bookmark the permalink. When’s dinner? Sounds scrumdiddleyumptious! Beautiful photos and wonderful, wonderful posts. I always get tons of cooking ideas but just lack the vegetable garden to run out to in order to gather such beautiful and tasty ingredients! So love your blog – it’s the best!! Sorry about mistakenly sending the Local Cider column as a post. I meant to put it in Pages and it’s there now. Just pull down the Green Living Columns to find it under Cider and Wine. Recently purchased some purplette seeds because of the excellent description in this post. Now to wait for the right time to sow!